Colombo is not the most amazing capital of the world. And visitors in a hurry or eager to see the most attractive places of Sri Lanka should prefer to spend their holiday in less noisy and less dusty and much more charming parts of the island. However, some cultural tourists do not want to leave a country without visiting the capital. Others have already seen many other places in Sri Lanka and like to visit Colombo during their second or third holiday. Some business people and stopover travellers have to spend some time in Colombo anyway and may wish to learn more about the places of interest of the city. Last not least, Colombo has the largest variety and the best hotels in Sri Lanka. People who like to enjoy the comfort of high-class hotels and the excitement of the busiest city will like to stay a few nights in Colombo. So here we present a Top 20 list of what could be worth a visit or is recommendable for your Colombo itinerary. Pettah is the busiest and most virulent quarter of Colombo, with a variety of open air bazaars and roofed markets. The streets are packed with people and carts and motorbikes. Here you can study authentic Southasian city life. It’s definitely not a tourist shopping mall. Each street is a department of its own, selling specific goods often produced at the same place. That’s the traditional kind of markets in Asia and shopping in Sri Lanka. Furthermore, Pettah is a melting pot of Muslim, Tamil and Sinhalese traders and customers. It may be noisy and nerving to walk along the crowded street, but don’t miss it to get in touch with Sri Lanka. An oasis of peace amidst the hurly-burly of Pettah is the Dutch Colonial Museum in the Old Dutch House, a restored original building from the 17th century. Sri Lanka’s National Museum in Colombo is a must-see for all lovers of ancient Buddhist art. The most important Buddhist sculptures and carvings from all parts of the island are collected in the National Museum for safekeeping and documentation. Some of them belong to the masterpieces of Asian art. You can also study the Kandy and colonial period and works of traditional folk art in the museum. Kelaniya is a north-eastern suburb of Colombo. The Kelaniya temple is the most significant Buddhist shrine in the Western Province, because it is sanctified by a visit of the Buddha. Traditional Kandyan style paintings as well as works of 20th century art decorate the rooms and tell you many episodes of Buddhist history in Sri Lanka. An adjoining temple is dedicated to the guardian deity of the west of the island, Vibhishina, who is venerated by Hindus and Buddhists alike. Nelum Pokuna is a masterpiece of modern architecture in the heart of Colombo. It is named after President Mahinda Rakapakse and was financed with Chinese help. It can also serve as a convention hall. The outline of the theatre is inspired by the shape of a lotos flower with its eight petals. The same eight-petal layout can be found in ancient Sinhalese architecture, namely at a bath in Polonnaruwa, which is also called “Nelum Pokuna”, meaning “Lotos Pond”. Colombo’s promenade in the city centre is a meeting point for locals and tourists alike, particularly at weekends. The green stretches between the colonial buildings of the former parliament in the north and the Galle Face Hotel in the south. Many stalls along the shore offer snacks and drinks. Occasionally, public mass gatherings and festivals are held on this largest square in central Colombo. Beira Lake consists of 2 parts, which are called "Greater Beira" and "Lesser Beira". Indeed, they are two different lakes in Colombo City, but interconnected by a system of channels. Lesser Beira Lake, bordering Nawam Mawatha and near the Indian Ocean, is the main attraction. The Seema Malaka Temple is situated pituresquely on islands in the lake. Due to the walking track around the lake and a swan boat service, Lesser Beira Lake is a popular evening spot at Colombo's suburb "Slave Island", wthin walking distance from many hotels. Greater Beira Lake at the border to Colombo Fort and Pettah is the home of the Colombo Rowing, regattas between clubs or schools take place here. "Lakehouse", one of Sri Lanka's most renowned publishers, is located at the northern end of Great Beira. Independence Square is situated in the Cinnamon Gardens district of Colombo. It is dominated by the Independence Memorial Hall, which is built for commemoration of Sri Lanka’s independence from the British rule, which came into effect on the 4th of February 1948. The monument was built at the location where the formal independence ceremony took place. In front of the Independence Hall is a statue of the first prime minister, Don Stephen Senanayake. The Independence Day celebrations are held here annually. The design of the Independence Hall is based on the traditional wooden architecture of the Audience Hall (Magul Maduwa) in Kandy. The Zoo of Colombo, also called National Zoological Gardens of Sri Lanka, is located in the neighbourhood of Dehiwala. It’s one of the oldest zoological gardens in Asia. Founded as Colombo Zoo already by John Hagenbeck in the late 1920s and united with the local Dehiwala animal collection in 1936, the National Zoological Gardens today exhibits 3000 animals of 350 species, it also places an emphasis on wildlife conservation and biological education. The Dehiwala Zoo contributes to exchange schemes with other zoological gardens for breeding purposes. The zoo area has been designed into a beautiful garden of colourful flowers and water fountains. Mount Lavinia is the name of a rocky promontory of Dehiwala, which is a neighbourhood of Colombo. Mount Lavinia is famous for its stylish colonial hotel close to the best beach of Colombo. It is built up around the original residence of Sir Thomas Maitland, British Governor of Ceylon 1805–1811. At a party held on the day of his arrival on the island, he fell in love with a local mestizo dancer called Lovina. He then met her regularly in his residence. Mount Lavinia has a romantic reputation ever since. Diyawanna Oya, also called Parliament Lake, is the landmark lake of Colombo within Sri Jayawardenapura Kotte, 15 km east of the city centre Sri Lanka. The new Sri Lankan Parliament Building was built in the early 1980s on the 5 hectare island called Duwa, which forms the centre of the lake, using dredgings from the surrounding marshlands. The island was the site where the palace of the King Vikramabahu III's powerful Minister Nissaka Alakesvara had been situated during the Kotte period in the late Middle Ages. The Parliament building was designed by Sri Lanka's most renowned architect, Deshamanya Geoffrey Bawa. On the 29th of April 1982, the new Parliamentary Complex was declared open by President Jayewardene. Gangarama close to Beira Lake is Colombo’s most popular Buddhist temple with tourists and a must-see for most individual travellers visiting Colombo. Gangarama is a typical local temple where Buddhist devotees fullfill their rituals. For example you can observe this at the Maha Bodhi Tree in the courtyard. At the same time, Gangarama is also an exhibition of Buddhist culture and an eduational centre for Buddhist studies. The buildings are from the 20th century, but the history of this place dates back to the early times of Buddhism on the island 2000 years ago. Sri Kailasanathar Swami Devashthanam is a Kovil hidden between railway lines, not far from Colombo Fort Railway Station, but only reachable from the opposite site. Actually, Maradana Station is closer to the access road than Comlombo Fort. The area was once called “Captain’s garden” by the British. The Tamil Kovil is said to habe been built here already during the Portuguese period. Anyway, it’is the oldest Hindu temple in Colombo. Today, it’s one of the largest and most colourfull Tamil temples in Colombo, also frequented by some Sinhalese Buddhists. Originally, it was a family temple. 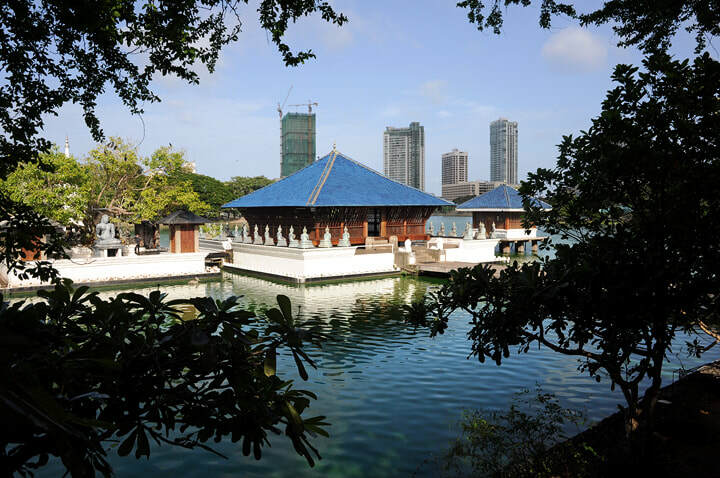 Located centrally in Colombo downtown, this park provides welcome respite from the hustle and bustle of the city. It’s located just opposite the "White House", which is Colombo’s old city hall, a landmark colonial building due to its dome. The colonial name of the gardens was “Victoria Park”. But after independence it was renamed, Viharamahadevi being the mother of the Sinhalese national hero, King Dutugemunu (Dutthagamani in Pali language). Viharamahadevi was born in the area that’s now Colombo. An ornate golden Buddha can be seen at the entrance of the park. Squirrels are running around in the lush green, Viharamahadevi Park also offers plenty of activities for younger children. The Wolvendaal Church is the oldest still existing Christian house of prayer on the island of Sri Lanka. It’s from the Dutch colonial period, and it looks so. It`s built with assistance of the VOC (Dutch East India Company) in a typical Dutch Reformed style of architecture. One notable feature is that it has no altar. The congregation is surrounding the priest, who delivers his sermons in the very centre of the church. The decoration is spare, that’s typical for Calvinist churches, too. Much of the interior such as the pews is original, from the mid 18th century. You will find Dutch inscriptions on gravestones here. The Dutch called this area “Wolf’s Dale”, or Wolvendaal, because of the jackals roaming here. The church is constructed on a hillock near the harbour in such a way that ships entering the harbor had a clear view on it. The Colombo home of Sri Lanka’s most celebrated architect, Geoffrey Bawa, is simply called Number 11. It is situated in 33rd Lane, Bagatelle Road, Colombo 3, on a charming secluded cul-de-sac. Number 11 is open to the public for guided tours by appointments, offering a unique opportunity to look through Bawa's city home. The "Central Point" is situated in Chatham Street, right in the centre of Colombo Fort, near the clock tower and at the back of the Dutch Hospital. The museum will give you a glimpse of the history of Sri Lanka, particularly about currencies in ancient and modern Sri Lanka and international trade relations. There is also information about the economic history of other Commonwealth countries. The “Central Point” building, boasting of Corinthian pillars and roofed with a circular glass dome, is an attraction in itself, since it’s facade and interior have been wonderfully restored to its colonial glory, thanks to the support of the Central Bank of Sri Lanka (CBSL). Earlier on, the magnificent building was used by the army. The Lighthouse of Colombo, almost 30 metres in height, is operated by the Sri Lanka Ports Authority. It is located at Galbokka Point on the waterfront of Colombo Fort’s marine drive. This lighthouse was built in 1952 and opened by the first Prime Minster after independence, D.S. Senanayake. Due to its placement in a military security zone access was limited, particularly during the civil war before 2009. The view from the viewing gallery of the lighthouse to the growing skyline of Colombo is amazing. There are no entry fees. The lighthouse area will be replaced by the planned “Flood City”, an artificial peninsula of Colombo. Sri Ponnambalam Vanesar Temple is located in the Kochchikade area of Colombo, in walking distance from the Kotahena bus stand. This Hindu temple is designed according to the Indian vedic cosmos resembling a human body. Visitors are allowed to participate and observe the regular pujas but should avoid to take pictures without special permit. Located in Bambalapitiya area to the south of Colombo’s city centre, this is a delightful and peaceful temple with traditional paintings. Concerning the buildings, the Isipathanaramaya Temple is one of the oldest Buddhist Viharas in Colombo, Sri Lanka. It was constructed in 1916 by a wealthy merchant in memory of his son who was executed by British colonial officials. In honour of the temple, the former Greenlands Road close to the temple was renamed Isipathana Mawatha and the nearby Greenlands College Isipathana Maha Vidyalay in the late 1950s. The former Colombo Terminus Station, opened in 1865 was closed in 1906 and replaced by the Maradana Station, due to a new railway scheme in Colombo area. The old terminus station now is the home to the National Railway Museum. Currently it houses two locos and some old waggons and provides information about railway history in an indoor gallery.